The CarisTouch is a versatile All-in-one. It can be configured as a diskless thin client, running applications off the server. It also has the processing power to run complex applications under Windows or Linux. With plenty of Serial and USB ports available, the CarisTouch allows seamless integration of many devices, such as badge reader, biometric reader, proximity reader, barcode scanner, and wireless network. The CarisTouch has a longer shelf-life than many other All-in-ones, therefore allowing large enterprise roll-outs to install the same CarisTouch model over a number of years. This committment will reduce the deployment and support overheads, and allows our customers reduce the total cost of ownership of the equipments. 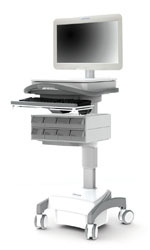 Ideal for nurse documentation, EMAR, CPOE, nurse stations, infotainment, patient check-in, and time clock. Note: Standard model uses 200GB HDD, which can be replaced with a Solid State Drive. Please contact info@pioneerpos.com for alternative configurations.